Vice Presidential hopeful Mike Pence announced yesterday during a press conference for the upcoming Vice Presidential debate that should Donald Trump win the presidency this November, his first official act as VP will be to hunt down and destroy all of the remaining Jedi. 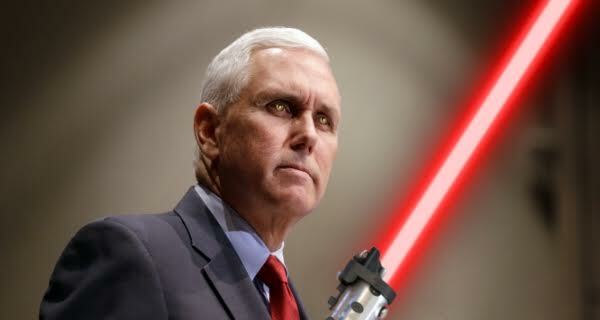 When asked what kind of “will” he might be called upon to enforce, Pence told reporters that his duties would most likely include commanding the stormtroopers in Trump’s “deportation force,” overseeing the construction of Trump’s wall/orbital planet destroying laser, and, of course, getting rid of the aforementioned Jedi. Pence’s response was at first met with chuckles and looks of incredulity, but the crowd’s reaction quickly turned to one of horror when the former governor of Indiana raised his hand and started to remotely choke Wolf Blitzer from behind the podium. No one spoke for over thirty seconds as Blitzer clawed at his crushed larynx, struggling to draw air into his lungs. Finally, just as the CNN reporter was about to pass out from lack of oxygen, Pence lowered his hand, breaking the invisible grasp on Blitzer’s windpipe and allowing him to breathe once again. “I find your lack of faith disturbing!” Pence boomed menacingly to the shocked crowd. Mike Pence then switched gears and showed off conceptual drawings for the new helmet and respirator combo he was having commissioned. When one of the reporters summoned the courage to ask Pence if he was prepared for the upcoming vice presidential debate, the former Governor replied with confidence that it would be, “All too easy!” But admitted that there was one area where he still needed work.